Our dear friends Dean (left) and Mark (right) recently moved to Arkansas from Northern California due to a job change. We miss them! Dean called Friday afternoon to let me know they were in town and would love to see Charles and me. I had just gone to the Farmer's Market at the Ferry Building last weekend and bought some great cheeses from The Cowgirl Creamery. Invited them to come over to enjoy wine and a great cheese platter. Red Hawk - Made by Cowgirl Creamery, triple cream, washed rind, cows milk cheese, aged 6 weeks with a brine solution. A bit stinky, but divine! Point Reyes Farmstead Blue Cheese - made by the name sake, creamy, salty flavor, aged 6 months, one of the best blue cheeses around! Midnight Moon - Made by Cypress Grove, goat's milk cheese, dense and chewy, aged one year, brown butter flavor with caramel undertones. In a word - WOW! Lamb Chopper - Made by Cypress Grove, sheep's milk Gouda, smooth, buttery with a light fruity aroma. Great sheep milk cheese, especially once it comes to room temperature. 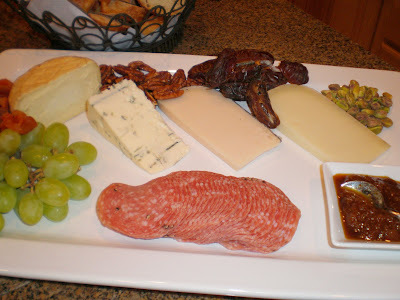 Accented the cheese platter with grapes, dried apricots, sweet & spicy pecans, medjool dates, pistachios, salami and a fig jam. Bought a fresh baguette! 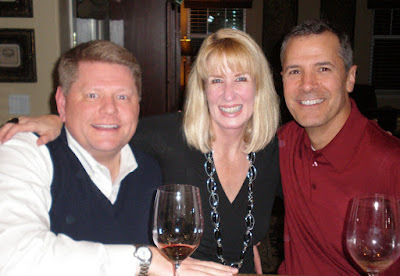 We had a great Chardonnay from Steven Kent Winery in Livermore and a wonderful Cabernet Sauvignon that Dean and Mark brought. Great to spend a relaxing evening with such great friends!